El Calafate sits near the bottom of the world, nestled near the southernmost point of Patagonia, Argentina. It is a wondrous place full of sights rarely seen anywhere else. 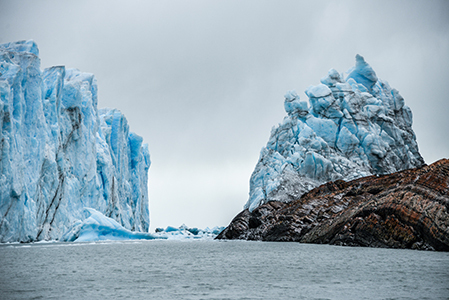 From caves to glaciers to still, blue lakes—El Calafate is the nature lovers paradise. And, today, GT Tours wants you to know all about this magical place. El Calafate is located on the south bank of Lago Argentino (Lake Argentina), where the Santa Cruz plateau meets the Andes. Surrounding the small is wide expanses of serene, natural settings, flamingos in the lake, and white-tipped mountains. Its name is derived from a local plant called the Calafate, a thorny bush found throughout Patagonia. The Calafate bush sprouts eye-catching, yellow flowers in the spring; and a purple fruit in the summer. Tradition states that those who eat the fruit will always return to Patagonia. El Calafate is a small town with one main street, Avenida del Libertador. Here you’ll find quaint shops, cafes, restaurants, and different types of accommodations from one to five stars. The El Calafate Historical Interpretation Center, easily accessible in town, is the place to find exhibits on the natural beauty and human history of the area. Also from the town, you can head out on Lago Argentino’s beautiful water for boat tours and fishing. The area around El Calafate is filled with activities to write home about, or nowadays Instagram about. There are ranches (estancias) all around the town center that you not only find lodging, but also dine at and find horseback riding. Hiking trails give you a chance to reconnect with pure wilderness and the peace it brings. Only about a kilometer away is the Laguna Nimez Municipal Reserve. This is a reserve that hosts more than 80 types of birds (including flamingos), and features hiking trails to stroll about watching these birds in their natural habitat. 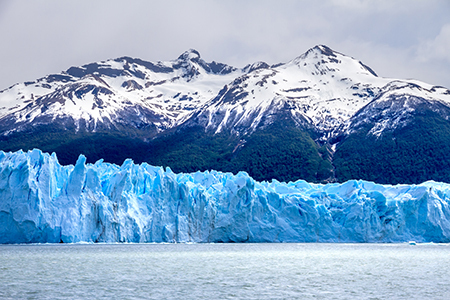 The Perito Moreno glacier is the primary point of interest for most tourists. Named after the explorer Francisco Moreno, who studied the area in the 19th century, it is located in the UNESCO word heritage-listed Los Glaciares National Park. It is less than a 2 hour bus ride from El Calafate, which is short compared to the relative distance of the wide expanse that is Patagonia. The glacier is a staggering 3 miles wide, with an average height of 240 ft. Its blue and white wall of ice is only the start, as it reaches to a total depth of 558 ft. Unlike other glaciers, which are shrinking, Perito Moreno is actually growing. The reason for this is unknown. Many boat tours cruise by the glacier on a daily basis. So, it’s easy to catch this puzzling monolith, and completely worth it. El Calafate is the starting point for many different activities and adventures around the Patagonia area. It is a place to refresh and renew from the stresses of everyday life, giving you a chance to slow down and catch your breath. With daily flights to El Calafate, GT Tours is always ready to get you to the elegance at the end of the world. Your explorations will be memories long held. Perito Moreno Glacier. within Los Glaciares National Park. This glacier is an impressive ice river with a surface of 257 square kilometers (99 square miles) and the height of the front wall oscillates between 50 and 60 meters above the lake level. During the tour a walk along the walkways located in front of the glacier allows us to admire this impressive natural wonder from different view points. Go on an active trekking excursion to Esmeralda Lagoon. A 3-hours trekking along the coast trail to reach Tierra del Fuego National Park. Arrive at Lake Acigami and from there we sail to Lapataia Bay. Later, transfer to the west zone of the island to Larsiphashaj River and from there we begin to row towards Estancia Harberton. Later at Martillo Island we do penguin watching from the boat. We continue onto Gable Island, have lunch there and return to Ushuaia. 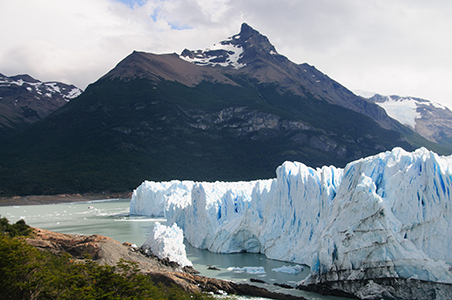 Explore part of Los Glaciares National Park and Lake Argentino and Perito Moreno Glacier. Visit Puerto Banderas where we embark to sail Lake Argentino reaching the Upsala Glacier and then we take Cristina Branch to finally arrive to Estancia Cristina. Then choose between hiking, trekking, or horseback riding.